Roll two equal-sized balls of catalyst putty and base putty and simply kneed them together like dough. Excellent for external shapes. Simply spread over master pushing down with fingers and wait for cure 8-10 minutes. You have 3 or 4 minutes of manipulation time. Therefore 14 minutes start to finish. You can also cast internal shapes and cavities but some pressure should be applied such as a weighted object on top. A "Ready-To-Fill" Mixing and Dispensing System that Enables You to Make Quick and Accurate Reprorubber Replicas...Without Manual Mixing and Fuss! Replica is easy to remove-even if there are under cuts or grooves. Cross-sectioning of replicas is easily accomplished with a knife or razor. 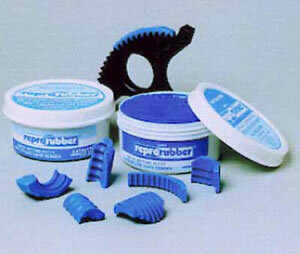 Reprorubber copies can recopied (copy from a "female mould" yields a male-shaped replica. Replicas are permanent-will not leach or ooze out nor outgas. NO MORE 16 HOUR CURE TIME AS WITH RTV SILICONES. MORE ACCURATE THAN ALL OTHER RTV COMPOUNDS. 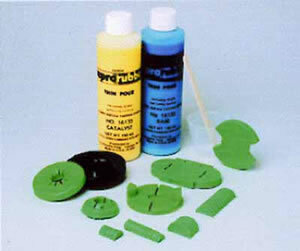 REPRORUBBER PUTTY will withstand up to 600ºF (or more).